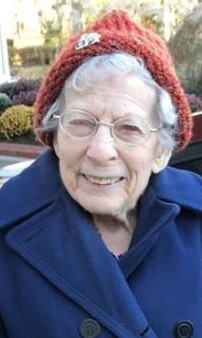 Nolan, Patricia Y., 92, formerly of Middle Highway, Barrington, died peacefully on April 10, 2019 surrounded by her loving family. She was the wife of the late Virgil A. Nolan Jr.
Born in Rome, GA, a daughter of the late Griffin D. and Gladys (Williamson) Young, she lived in Barrington for 47 years. Mrs. Nolan was a teacher at Cumberland High School for 25 years. Patricia graduated from Vanderbilt University and earned a Master’s Degree at Rhode Island College. Mrs. Nolan was a member of St. John’s Episcopal Church, Barrington. She was a member of the Cumberland Math Teachers Association. She was a volunteer at Linden Place, Bristol and was a docent at Roger Williams Park Zoo, Providence. She is survived by two daughters, V. Jane Morris and her husband Barrie of Louisville, KY and P. Marie Marino and her husband Anthony of Cranston; eight grandchildren and five great grandchildren. She was the sister of the late Ginger Faulk and Janeice Ploof. A Memorial Service will be held on Tuesday April 16, 2019 in St. John’s Episcopal Church, 191 County Road, Barrington at 1 p.m. Calling hours and flowers are respectfully omitted. Pat Nolan was one of the most loving women that we have ever known. We know her as a fantastic docent who always made people around her so comfortable. We first met Pat and her daughter Marie through Judo where I had the privilege to be the judo instructor of Pat’s lovely granddaughters. Pat was supporting her granddaughters in their chosen activity. What a wonderful family! I was blessed to have Pat on my team,when I was a Tuesday morning docent at the zoo. She was a wonderful teacher, a great listener,and a caring friend. She had a wonderful sense of humor and a willing smile. My condolences to her family. Pat will be missed by All who knew her. When I started as a docent I had the pleasure of working with Pat on so many occasions and looked forward to her “tell it like it is” attitude. She made me laugh so many times and her spirit added so much to the docent program. She is going to be truly missed. Patricia was always nice to see at the Zoo and chat on many occasions. I myself was a docent. And I know the dedication and her love for the Zoo was known by all. As a Zoo employee there is not a single person here that does not know and apricate all the time and work docents just like Patricia give to the zoo and it is what makes RWPZOO such a great place to work for those that visit. She will be missed. Please accept my deepest sympathy for your loss. My heart goes out to you and your family. I had the privilege of knowing Pat and working along side her for many years as a docent at Roger Williams Park and Zoo. She was a great teacher, knowledgeable with a wonderful sense of humor. My sympathy to her daughters, Pat will be missed. My deepest condolences to Pats family. We were docents together at Roger Williams Park Zoo for quite a few years. Pat was awesome! Pat was a great lady! Even with her severe hearing loss, she managed well, and always with her wonderful sense of humor. I miss her already, and send my very sincere sympathy to you all. Pat was a great lady! Even with her severe hearing loss, she managed well and all with a great sense of humor. I miss her already……..and send my very sincere sympathy to you all. Marie, so sorry for the loss of your Mother, thoughts and prayers for you and your family. So sorry for your loss. Greggs will always remind me of Pat. A fellow math teacher and friend. So sorry for your loss. Your Forest Park family sends you our love and sympathy. Marie,so sorry for your loss sending you lots of love at this hard time! I stumbled upon this sad news while looking up another obit. I recognized that smile immediately! I have fond memories of your Mom and your entire family. Please know my thoughts are with you. Marie, I’m so sorry for your loss. Sending big hugs to you and your family. Please let me know if you need anything at all. Marie, So very sorry to hear this news. We are all thinking of you and your family during this difficult time. Dear Marie, You have my deepest sympathy. Oh Marie-I’m so very sorry for your loss. You have my deepest sympathy and love. Marie, My heart feels for you at this sorrowful time.